Reade Signs specialises in delivering signage and wayfinding solutions, using innovative materials and design that boosts your brand. Our consultative approach means we support you right from the start – from initial budget, concept and design, through to production, installation and maintenance. We’re trusted by leading organisations to get the job finished, safely and to a high standard. Reade Signs is a Hampshire-based sign, graphics and design company established in 1980 and we have built our reputation by matching competitive prices with outstanding customer service. We have the most up-to-date machinery, technology and skilled, in-house staff making us a one stop shop for every signage and communication need. 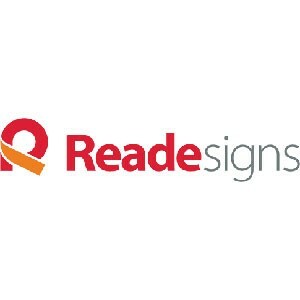 Reade Signs’ has ISO 9001 and 14001 accreditation so every aspect of the design, production and installation of your signage is planned and managed to an exceptionally high standard and has the least impact on the environment. Whatever your signage requirements, we help you communicate your message, with a flexible, fast and exceptional service. Please get in touch if you need eye-catching, high quality signage and a signage team with great technical expertise.